In today’s fast-paced digital world, where information is available at your fingertips, how does a business begin to compete? How does a business keep their funnel filled up with good quality leads? 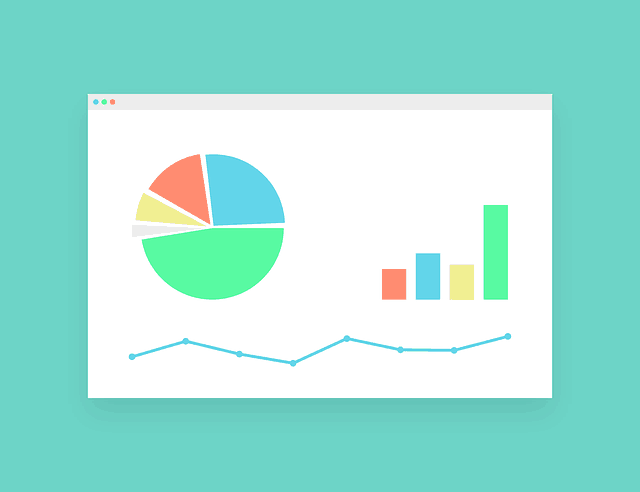 For most businesses, traditional advertising is declining in it’s importance and at the same time, spending on digital advertising and lead generation is rising steadily, year after year. Search engine optimization and pay per click advertising have risen to the top of the agenda for many businesses, to get their message out to their target market. Many businesses are investing in SEO or PPC services, without actually knowing why they chose one over the other and if either is working. This is a discussion that I’ve had over and over as I meet clients in a wide variety of industries. With a plethora of options to generate leads and companies offering various “guaranteed” methods to drive leads, I felt it was important to bring some clarity to the discussion. Organic SEO or PPC (SEM)? Which is Right for your business? It’s a tough question to answer and the answer isn’t as straightforward as you might think. This is a question that has been debated by experts on both sides, with each having valid arguments for SEO & PPC. On the flip side, PPC/SEM companies will brag about the instant results and measurable ROI with PPC. The TRUTH: PPC clickers are much more likely to buy. The truth of the matter is – If you are looking at the scenario one-dimensionally, they’re BOTH right in one way or another. PPC/SEM can deliver fast results. SEO can give you loads of free traffic. And that’s EXACTLY why I wrote this guide. There is major confusion about the subject of SEO & PPC marketing and it’s only made worse by an astounding amount of misinformation floating around the internet by companies pushing an agenda of self-interest, greed or ignorance! My aim is to give you a glimpse into SEO and PPC so that you can make an informed decision, and one that’s best suited to your company’s needs. I hope you will find value in the information provided. And I will try to keep it brief (My wife says I talk too much…)…but let’s be realisitc. It’s a HUGE topic. One last point before I move on to the good stuff; If you have questions before, during or after going through this guide, feel free to email me at jonathon@blakestrategiesgroup.com. Search Engine Optimization: What is Search Engine Optimization (SEO)? Understand? I didn’t at first, either. You go to Google and search for a product or service. You see a long list of items, and like most people you scan at the listings on that page and click on the ones that look the most relevant to you, usually starting at the top and working your way down. The results below the PPC ads, are “organic” which means no one has paid Google directly for those listings to be included in the search. See the image below to see the difference between the PPC and organic listings. Google has a tremendous amount of control over the success or failure of your business because unless you are paying to have your ad at the top of a page, Google decides who goes where in the organic results. That means that Google decides if your website shows up #1, #5 or number #77. If you are not slightly concerned that Google decides if your business gets found or doesn’t, you should be! Considering that 90% of the population turns to a search engine like Google to search for the products and services that they need, should make you concerned if they can’t find your website. It’s not that you don’t have ANY control over where your website shows up, because that’s not completely true. We do have the ability to INFLUENCE the results of search engine rankings, which is really what SEO is all about. The trick is, you have to know the rules and you have to play by Google’s rulebook to move your website further up the pages of thousands of search results, thereby improving your ranking. How Can Organic Rankings Improve? Representatives from Google have suggested that there are over 200 factors that their algorithm looks at to determine where your website goes. Just because you think your website looks nice, doesn’t mean that Google thinks it should be on the first page of Google for the terms that important for your business success. This is where an SEO company comes into the picture. Companies like ours have tested, studied and measured the effects of various techniques that can help or hinder your website rankings. We know the things that we need to do to increase your organic rankings and we know the things to avoid that might damage your rankings. SEO itself isn’t brain surgery, but what makes it more challenging is that the target moves from time to time. Some of the things we were doing to improve rankings as recently as last year (nevermind what we were doing 3 years ago…) no longer work, or even worse – are practices now discouraged and will probably get you penalized by Google. What’s a Google Penalty & How Can Google Penalize Me? Imagine 80-90% of your website traffic GONE – Practically overnight. This happens to businesses over and over and in some cases, it has catastrophic effects to their overall business, and yes, it’s Google’s doing. But why? Google has decided that you, or your SEO guy, has done something that has gone against their webmaster guidelines, and has therefore punished you by banishing you off of page 1 in their search listings (which is why you were so busy in the first place), and in some cases, never to be found again. Practices like excessive link building or using hidden text on a page will cause Google to take notice and penalize your website. Once the penalty happens, they will often notify you through Google Webmaster Tools and recovering from a penalty can take significant time and effort. While it may sound harsh, Google created these guidelines in an effort to show searchers the highest quality websites, by placing them on the first page of the search. It’s not all bad news though! There are genuine opportunities to improve rankings through 100% ethical and “white hat” techniques that WILL move your website higher in the Google ranking system. Depending on the statistics that you believe and how the data is reported, somewhere between 80-95% of website visitors click on organic listings first and they trust them more than PPC listings. This means that if you type in your top 5 products or services and you can’t find your website, you might be missing out on the bulk of your potential customers eagerly looking to purchase your products or services. Certainly SEO has it’s downfalls, but to ignore it is to risk missing out connecting with your target market. Search engine optimization holds a special place in my heart because it’s the first area of interest for me, when I jumped into digital marketing in 2005. At the time I was working as a failing mortgage broker and all I needed were LEADS. Heck, I would have settled for warm bodies. I was so desperate to get some names, email addresses or phone numbers of someone…ANYONE who was interested in chatting with me. Fast forward a few months and someone told me about SEO. At the time, they suggested all I needed to do was to write 1 page per day on my website and I would quickly rank in Google for the terms that I was targeting. My goal was to get to the first page of Google for searches like “bad credit mortgages,” “self employed mortgages” etc. A few short months later, after much trial and error, I was on page #1 for some of the terms, and I was getting people to fill out a mortgage application to the tune of about 2-3 per day. But I learned something valuable about marketing in general. Not rocket science I know, but in this particular market, it was an unhelpful lesson. I thought ranking for these terms would guarantee success, but I was wrong. I had leads but I couldn’t close any of them, because the quality of the leads was beyond poor. There was a reason why they were low-hanging, but slightly rotten, fruit. After that tough lesson I learned something valuable and it changed the course of my life. I was much better at SEO than I was at selling mortgages and thus began a chapter which is still being written. In the end, is SEO worth it? While it has it’s pitfalls, like trying to play tag with Google’s ever-changing set of “approved” criteria, Search Engine Optimization is important to capitalize on the bulk of the website traffic out there. Visitors trust organic listings more. Once a website achieves high rankings, you get sustained traffic that can last many months or years with only basic upkeep. SEO takes time – It’s front-loaded with cost, before you see any results. If you haven’t given it 6 months, you haven’t given enough time to see if it’s having a positive effect. You’re held captive by Google’s algorithm changes – they could decide you don’t deserve to be on page #1 anymore and months of effort could vanish fairly fast. The investment in SEO could be quite high up front, depending on how competitive your niche is. There’s NEVER a guarantee of a 1st page ranking. Pay Per Click (PPC/SEM): What is PPC/SEM? In simple terms, PPC (Pay Per Click) or SEM (Search Engine Marketing) simply means that you pay to get your ad in front of your target market. Every time someone clicks on your ad, you pay a fee. Who do you pay? Google (or Bing) if you decide to advertise on that search engine as well. If you go back to the previous section and look at the image provided, we detailed which links on a search engine page are paid and which are free. “Pay to Play” or even better “Pay to Be FIRST!” might be a good way to explain it. The business that you see dominating the top and bottom spots on Google, with the little “Ad” text beside their listing are the ones that are paying to be there. Every time you, or one of their customers clicks on that ad, the company gets billed a small fee. Depending on how competitive the niche, that fee can be anywhere from 5 cents to $5, or even more in some cases. For simplicity’s sake there are 4 types of PPC Ads. There are more, but in an effort to NOT overwhelm you with information, we will stick with 4. Google Search Ads – Search network ads are those that you see on the top and bottom of Google search results when you type in a search for a product or service. Google Display Ads – These ads appear on millions of websites around the world. If you notice small text or image ads, for various business, when you’re reading your local online newspaper, a favorite blog or another website, most are hosted by display ads from Google. Google Remarketing Ads – Do you ever feel like you’re being followed as you surf the web? You have likely searched for something in Google, went to a website but didn’t take action. Now, everywhere you go on the internet, you keep seeing ads for the website you visited yesterday or last week. These are Google Remarketing ads. They give you the ability to reach out to people who recently visited your website to keep your company top of mind. YouTube Video Ads – Sometimes annoying, these are the ads that appear before you watch a video on YouTube. Often they make you watch the first 5 seconds before you can click the skip button and go on to watch your funny cat video. Every time I talk to business owners about PPC, almost immediately they tell me they cannot afford Pay Per Click because they have visions of getting hundreds or thousands of clicks in a month – leading to bankruptcy. This is a misconception of how the system actually works. Pay per click ads are fully controlled by a daily budget and by a maximum cost per click. PPC campaigns can be setup with a budget set to whatever you want to spend in a day. For example, let’s say you choose a budget of $50 per day ($1500 in a 30 day period). Once your $50 is exhausted, your ads stop showing, and therefore stop getting charged, until the next day when you start over again. While this sounds simplistic, there are a lot of factors that go into setting up a campaign properly, so you get the biggest bang for your buck. Not only do you have to set up the AdWords or Bing account properly, you have to target and bid on the correct terms (i.e. key words or phrases), and know which terms will generate conversions (people who call or email you). You also need to make sure that when someone clicks on your ad, you’re sending them to the proper spot – a well-crafted, conversion-inducing, or lead-generating landing page. If anywhere along the chain, something isn’t right, the campaign will fail and you won’t see an return on investment. Is it true that many PPC Campaigns fail? Yes, it is true that many campaigns fail BUT don’t write PPC off as being ineffective. Poor targeting – If a campaign isn’t setup to target the right traffic, you can get lots of clicks, lots of impressions and no new leads. Ineffective landing page – when a searcher clicks on one of your ads, they end up somewhere (on your website or a page of your website.) If the information conveyed on that website isn’t formatted properly and targeted to the audience, the campaign won’t be effective. Wasted Ad Spend – This is as a result of #1 and #2 above. It’s easy to get a high volume of clicks, but if they aren’t from the right people, who are interested in your product or service, it’s all a big waste of your investment. Despite the issues above, PPC can be very effective depending on the niche, BUT it’s important to work with someone who knows what they’re doing. A good place to start is to ensure the company is a Google Partner. One of the reasons I LOVE pay per click ads is because you can setup a campaign and start getting traffic relatively fast. Even better, when the campaign is setup well, you can get GOOD leads relatively fast. But, let’s back up and ask an important question before we move on. Do you know your acquisition cost for leads & sales? This is an important question to consider before you start using a PPC campaign because it will determine whether you have a positive return on investment. PPC campaigns are a numbers game, similar to that of a salesperson. Good salespeople know that if they make 100 phone calls, they might get 10 appointments and 2 sales. Of course these are just sample numbers, but they illustrate an important concept for anyone who wants to advertise with pay per click ads. Consider this: If you spend $1000 in one month on PPC ads, and you generate 20 leads, in simple terms your leads cost $50 to obtain. If you sell a product or service where you don’t make at least a $50 profit, you’ve already lost money. 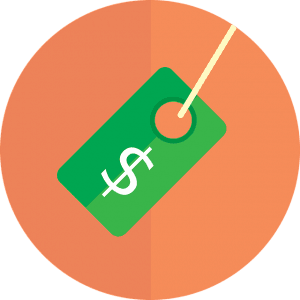 If you are in the business to business market and your cost per lead is $50, but your products and services have thousands of dollars in profit, generating a positive ROI is more than possible. Spending only $50 to get thousands is a pretty good deal! The moral of the story: Know your numbers before you start and remember that PPC is an investment! Any investment simply means that you put money in, with the expectation of return. The goal of a lead generating PPC campaign is to multiply that initial investment. Another reason I enjoy working with Pay Per Click campaigns is because it’s like hunting a specific target. Once you have your target in your sights, hitting that target is much more achievable. If you know that you want to put an advertisement in front of a potential customer typing “emergency plumber” in Google, you can with PPC! If the potential customer clicks on your ad and finds the information helpful, they will call you or fill out your quote form. The amazing thing about PPC is that it’s highly trackable. For example, if the person who searched for “emergency plumber” on their cell phone then clicked on the phone number you provided in the ad, we can easily track that lead back to that particular ad. Also, it’s easy to see if a quote form was filled out as a result of someone clicking on your ad. With proper tracking, it’s easily identifiable if an ad is working or not. And sometimes, all it takes are a few tweaks to turn a low-performing ad into a high-performing one. One of the major downfalls of most PPC campaigns is that tracking is never properly setup and this makes tracking ROI hard. For a PPC marketer, the worst thing we can do is rely on our clients to say “I think it’s working” or “I think we’ve been busier.” Thinking and knowing are very different things. 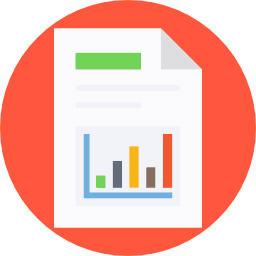 The goal is to setup a system where you KNOW that an inquiry came from your ad campaign so you can attribute that lead to the effectiveness of your PPC campaign. Data leads to knowledge. At this point you have a handle on SEO & PPC, but you’re still left to determine which is right for your business. So, what’s the MAJOR Difference Between SEO & PPC? Not overall cost really, but when and where you invest the money is going to look slightly different. With The pricing models that most internet marketing companies use, SEO is going to be front-loaded with cost. For a good SEO company, depending on the size of your website and a number of other factors, expect to pay $1000+ per month in fees. Here’s the catch with SEO. You end up paying that $1000+ payment for several months before you see the results. You will need to trust that your SEO company is working to improve your rankings, but you won’t “KNOW” because you may not see anything concrete for 3-6 months. This is a hard pill to swallow for many businesses. But, as many successful business owners understand, you often have to spend money to make money. I used the $1000 monthly fee as a random number, yours may be higher or lower, but a word of caution on pricing. Be wary if you see companies offering suspiciously low SEO package pricing ($199, $299, etc). Many use outsourced, low cost service providers in various countries around the world and quality can be an issue. Also, a good digital marketing company should never be able to quote on how much your monthly spend will be until they understand your company and your products or services. There’s no such thing as a “cookie-cutter” approach with SEO, or PPC, for that matter. PPC, on the other hand, can provide faster results. Once a campaign is set up and running, you will start seeing your ads right away. That in itself is a “win” for many, but comes with a caution as well. A good PPC campaign takes some time to get traction. Just because it’s set up and you see the ads running, doesn’t mean it’s optimized and running at peak performance. This is a process which, like SEO, can take several months to really see awesome results. There have been instances where a client’s campaign goes live and they get leads within hours. In circumstances like this, we see small wins at the outset, but the following months will be filled with more tweaking to ensure that your acquisition cost or cost per conversion is within an acceptable range. What would I do, if I was in your shoes? Assuming that I had $2,000+ per month to invest (yes, invest – not spend) on digital marketing per month I wouldn’t put all my eggs in one basket, that’s for sure. Use PPC & SEO together! If we know that 70-80% of the traffic comes from organic, we definitely CANNOT ignore SEO. That would be foolishness, but on the flipside, if we know that PPC visitors are more likely to buy, it would also be foolish to avoid PPC. Using PPC and SEO together can be a powerful lead generating machine. I like to call this the “1-2 Punch” because it’s so effective in generating high volume of traffic and leads. When and if the budget allows, this is the recommended course of action. 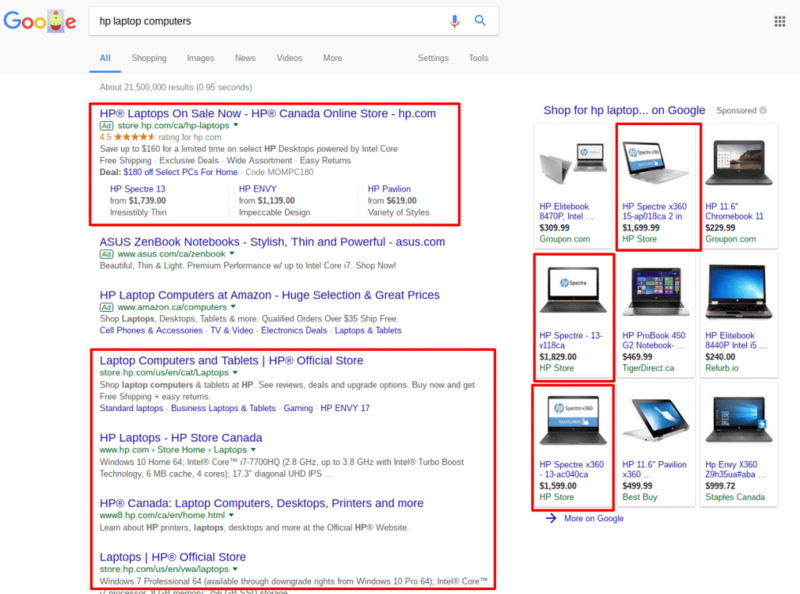 As an example, I Googled the phrase “hp laptop computers” just to show you how effective using PPC & SEO together can be. The Power of SEO & PPC together is evident! HP owns the front page, all with links to their own products on their own website, not Amazon or the big-box stores. They have invested in proper SEO techniques and effective PPC that gives them a tremendous amount of front page real estate. The links shown in the top section and the right side are PPC ads. The links shown in the bottom red box are organic results, as a result of SEO efforts. SEO or PPC – Moving Forward: Where to Next? The last chapter of this book is dedicated to helping you plan where to go next. Now that you know what’s-what when it comes to SEO and PPC, the way forward still might be clouded with confusion. We want to uncover new markets & new customers. I search for our products or services on Google and I can’t find them on the first page. I search for my products and services and I see my major competitors using PPC or ranking organically. We rarely get inquiries through our website. We used an SEO guy in the past, and it didn’t work so we don’t want to waste more money. We tried a PPC campaign in the past and it didn’t work. We have someone in-house looking after our digital marketing, but we don’t think we’re getting results. We have a PPC campaign running, but we aren’t tracking our metrics properly, so we can’t connect inquiries with sales. Looking through these statements, which one resonates the most with you? These statements can be a great conversation starter with a prospective Digital Marketing agency or expert. If more than one statement is needed to sum up your problem, that’s ok! A good expert or agency will be able to help you through it. 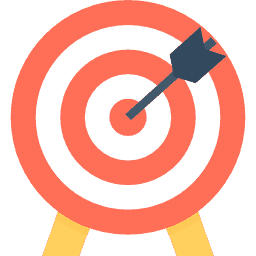 Before you ever start marketing (both online or offline), it’s a good idea to know who your target market is, and make sure that’s the target market you want to work with. If you pitch your services to a certain demographic and you succeed in getting them to contact you, are they ACTUALLY going to buy? 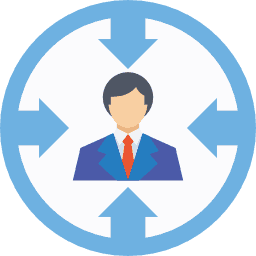 Part of identifying your target market is knowing who they are, why they would use your services, and/or how their business works in relation to yours. I would suggest knowing as much about your target market as possible. Really take the time to understand who they are, how they buy, the buying/sales cycle, what makes your offer more attractive than someone else’s offer. When using Pay Per Click services, this is a critical component of success. How can you gauge how effective a campaign is, if you don’t know what an acceptable cost to acquire a lead or customer is? Know your numbers! There’s no sense generating leads, if for every lead that comes to you, you are losing money because the PPC costs just don’t make sense. The beauty of knowing your costs and creating a positive ROI on PPC is that it’s fully scalable. If your budget is $2000 per month in PPC clicks and you’re generating a positive ROI, all other things being equal, a $4000 campaign will also be profitable. Start with a Strategy Call with the prospective Digital Marketing company. Before a SEO or PPC company starts talking numbers, they will need to get to know a little about your business. Don’t be afraid to give a prospective Digital Marketing company some details about your business, your product costs, sales objectives etc because those details do help in putting together an accurate quote/proposal. Companies that talk pricing before they take the time to get to know your business should be a red flag. How can they possibly give you an accurate quote if they don’t know who you are, who your customers are and what your objective are? If you went to your Doctor for unspecified symptoms, would it be appropriate for him/her to prescribe a medication before they have determined what the illness is? In order to develop a strong client relationship from the outset, we need to ask questions to diagnose the problem before we can offer a solution. Once you know your problem and know who your market is AND you’ve chosen your desired service provider (expert or agency) it’s time to move forward. It’s Live – Now what? At this stage your plan is in motion, your campaigns are running and it’s time to start looking at your results. Keep in mind, that just because either your SEO or PPC campaign is running (or both), don’t expect a miracle to happen overnight. Amazing results do happen fast sometimes and leads can start pouring in right away, but usually there’s a period of testing before a campaign really starts to generate significant results. At this stage, measuring the success of your campaign is vital. A good SEO/PPC company will have various ways to track the effectiveness of the activities that they are doing and they should be able to provide you with metrics like pageviews, conversions, phone calls etc. PPC Advertising can generate amazing results and give you an edge over your competition. SEO is vital if you want customers to find you. A website without proper SEO optimization is like building a shopping mall in the middle of a desert. No one will ever find it! If you actually made it to this part – congratulations. This post is over 4800 words! Still have questions? Feel free to reach out to us here. I liked it. I was little confused about what is difference between SEO and SEM but now I got clear idea about it. Also Your article would be useful for beginners in Digital Marketing Field. Really great resource for beginners to understand the concept and difference between SEO & SEM. Thanks for sharing the guide.